Anukul Sudhakar Roy is an Indian cricketer who was a part of the Indian Under-19 World Cup team that won in 2018. He was born on 30th November 1998 and hails from Birha, a remote village in Bihar. The all-rounder is a slow left-arm orthodox bowler with the ball and comes in the final phase of an innings to get some quick runs for his side. The 19-year-old is an athletic fielder who has a powerful throwing arm, a dynamic lower order batsman and is a specialist bowler, a role similar to Indian All-rounder Ravindra Jadeja. The player from Bihar was unable to participate in the Ranji Trophy as they haven’t contested in the tournament for the last 18 years. However, Roy, like his friend Ishan Kishan, moved to Jharkhand to pursue his dream of playing in the Ranji Trophy. He had represented Jharkhand Under-19s before making it into the Indian Team after catching the eye of Rahul Dravid. He made his debut for the U19 team on 1st February, 2017 during England's tour to India. He bowled 7 overs at the cost of 34 runs and scalped 3 wickets in the process. He followed that with another 3-wicket haul as India went on to win the 5-match series by the margin of 3-1. 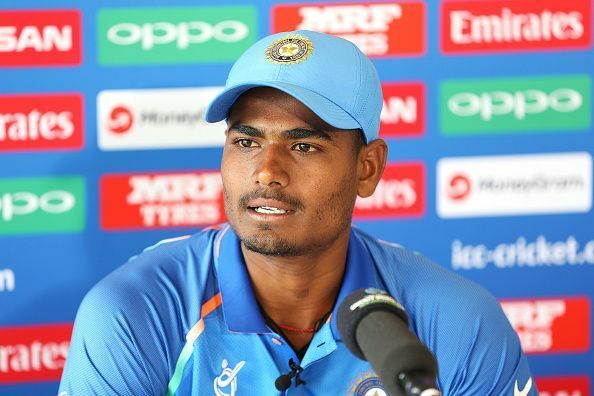 Roy made it into the U-19 team at the very last moment as an ankle injury forced him to miss the U19 Challenger Trophy and U-19 Asia Cup in 2017. But Rahul Dravid’s faith in him earned him the place in the final squad that was traveling as he was directly included after completing his Rehab process. Roy picked the wicket of Jack Edwards in the first match of the campaign against Australia in the opening match. Following that was his maiden fifer in the International level as India thrashed Papua New Guinea by 10 wickets with 252 balls remaining. He claimed 4 wickets in the 3rd match against Zimbabwe and a single wicket against Bangladesh in an economy of 2.80. Roy then scored 33 against Pakistan and claimed a wicket as India won the match and progressed to the finals. In the final that took place on 3rd February, Roy scalped the important wickets of Jonathan Merlo and Param Uppal (34), the highest run-getters for Australia in the match. This match resulted in India getting the coveted trophy for the 4th time in history. He had not played for any franchises yet. He came under the hammer in the 2018’s-Mega IPL auction and was snapped up by Mumbai Indians at his base price of Rs 20 lakh.